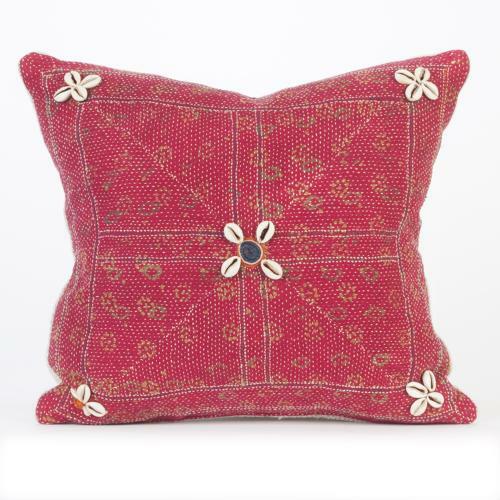 This cushion is made from a vintage Banjara textile. The Banjara are a semi-nomadic ethnic group found throughout the Indian sub-continent. They are re-known for their colourful textiles which they embellish with embroidery, cowrie shells and mirrors. This textile comes from an envelope bag which has been deconstructed. The colour is a pinky red, with dense off white kantha stitching. The cushion has a vintage hemp back, zip closure and feather pad. It can be viewed at my studio in Purley by appointment or please ask for a shipping quote. Good prices are available to the USA via USPS and covers can be shipped without pads if required.